When a remote viewer summoned the Goetian Spirit Sitri there was a surprise. It was as if this spirit knew he was going to have his picture not only drawn but it would be seen by thousands of people via the World Wide Web. Rather than stand and have his portrait made, Sitri chose to make a statement. He presented himself as the Hanged Man, a figure well known to Tarot Card users, with his finger pointing directly downward at the dome the Vatican. Surrounding this dome were three structures with upside down crosses on top of them. 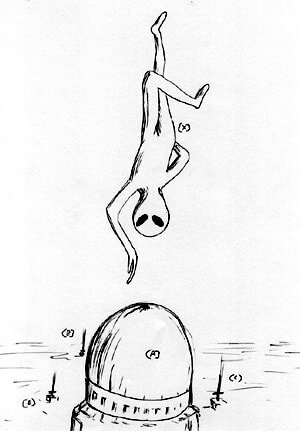 Notice that Sitri appears in this drawing as the classic image of the alien known as the Grey. Sitri appears to be telling us something that he thinks is important. But what is this message? To determine the message we turned to the root of everything known about Sitri. We examined what the old magicians had to say about him. S. L. MacGregor Mathers wrote that Sitri is the 12th spirit listed in the Goetia, and that he rules over 60 legions of spirits. But according to the old stories, Sitri first appears as a leopard's head with gryphon wings, then takes on human form when asked. Mathers gives yet another clue as to the message Sitri is sending. He said the spirit has "the power to instill love in men and women and to cause them to show themselves naked." Nakedness is behavior condemned by the church, and consequently much of Christian indoctrinated society. But is this the proper interpretation? Perhaps Mathers means that this spirit has the power to expose the dirty hidden secrets linked to human sexuality. The Seagate Adventurers' Guild Beastiary declares that "Sitri has the power to enflame men and women with the love of each other and to cause them to show themselves naked and frolic with one another in unseemly ways." We are reminded here of Crowley's declarations in the Book of the Law: "Do what thou wilt shall be the whole of the law" and "the name of restriction is sin." Is Sitri portraying himself as the hanged man because he wants us to understand how badly the church has suppressed our freedom of joyful sexual expression? Indeed, he appears as the perfect example of the bound and tortured slave. Thus we find here a link between church teachings of sexual suppression and the activities of Sitri. Is it possible that sexual repression energizes the church and this energy serves Sitri? It was written that "those who fall prey to Sitri are systematically consumed by lust and are thereby 'initiated.' Where any imbalance should be known between love and its force of lust, an adjustment will be made . . . "